With only one more book in this series, the end is in sight, and while I’m sad to see it conclude, I’m anxious to see how the journey will end for these characters that have become almost real to me. One of the things I enjoyed so much about this book was the number of characters included. 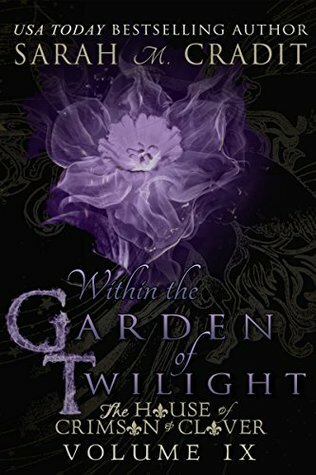 Some of the novels have focused on just a handful, but with Garden of Twilight, the reader learns exactly where everyone stands and how all of their individual situations are intertwined in the overall scheme of things. In short – be ready for a humdinger of a showdown in the last book. I was surprised a few times – especially with one character. I wouldn’t go so far as to say his actions were out of character – just sudden and unexpected. With another (my personal fav), I hated to see him hit rock bottom, but sometimes that needs to happen before you can become who you’re meant to be, and I’m excited to see his transformation. Thanks, Diana! Yes, I’ve become very attached to some of these characters – the all of the covers in this series are quite eye-catching.